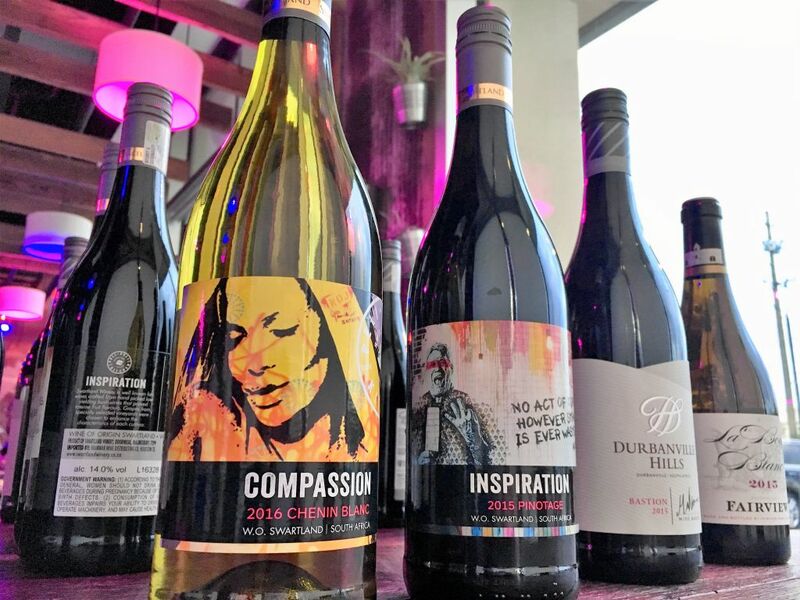 A wine for every course at the Peli Peli Kitchen and Houston Food Finder Dinner. Photo By Beth Levine. Peli Peli Kitchen at 9090 Katy Freeway hosted a Houston Food Finder Reader Dinner this past Monday featuring four of the restaurant’s popular dishes paired with an equal number of South African wines. Peli Peli Kitchen is the more casual spin-off of the original Peli Peli restaurant. Like the original, it offers dishes by chef Paul Friedman that feature traditional South African ingredients—but also incorporate hallmarks of other cuisines for inspiration. (The Indian naan tacos, stuffed with meats like “Huguenot pork belly” and “South African fajitas,” is an example.) Peli Peli co-owner Thomas Nguyen and Houston Food Finder editor and publisher Phaedra Cook co-coordinated the event. Attendees Relaxing at Peli Peli Kitchen. Photo By Beth Levine. 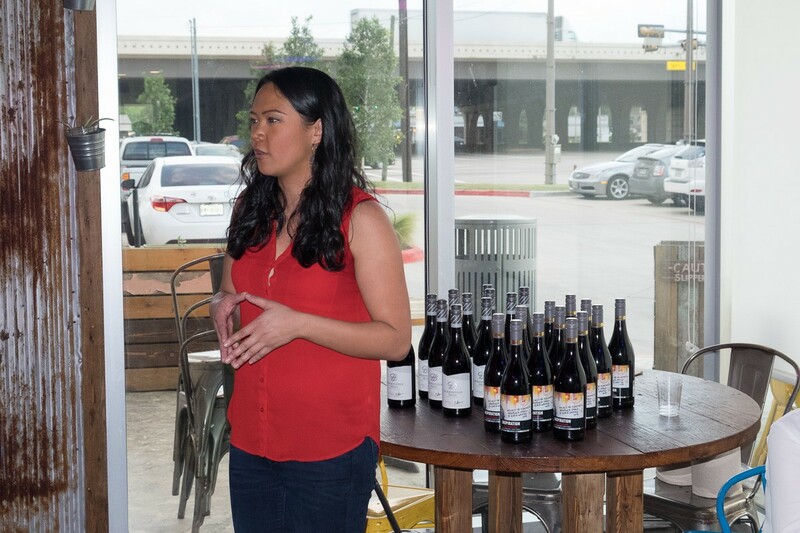 Sommelier Michelle Cimafranca was responsible for pairing the four courses with South African wines. Some of the wines, such as the 2016 Compassion Chenin Blanc and the 2015 Inspiration Pinotage, are Peli Peli Kitchen’s own private label. These, as well as others mentioned below, are available to purchase at retail prices on-site. Cimafranca has over ten years of experience in the industry. After a stint as a paralegal, she was inspired to pursue a career in wine after reading Karen MacNiel’s The Wine Bible, as well as by a love of legendary winemaker Heidi Barrett’s Amuse Bouche wines out of Napa Valley. Michelle Cimafranca, sommelier of the Peli Peli restaurant group. Photo by Phaedra Cook. First up was the lightest of all the courses: Cucumber Salad with onions, tomatoes, peppadews and vinaigrette. The spice and zest from the salad was highlighted by the peppadews, a sweet and piquante pepper brought by Portuguese settlers to South Africa. For several attendees, this was their favorite part of the salad as the peppadews lent equal amounts of spice and zest. To accompany the fresh, crisp flavor of this dish, Cimafranca chose the 2016 Compassion Chenin Blanc for its “clear, bright pale straw color and medium density with aromas of tropical fruit, grapefruit and sweet floral notes.” The 2016 Compassion Chenin Blanc is made by Swartland Winery in South Africa and sells for $7 per glass or $20 per bottle. The Curry Chicken at Peli Peli Kitchen. The special rendition for Houston Food Finder readers substituted shredded spaghetti squash for rice. Photo By Luke Chang. 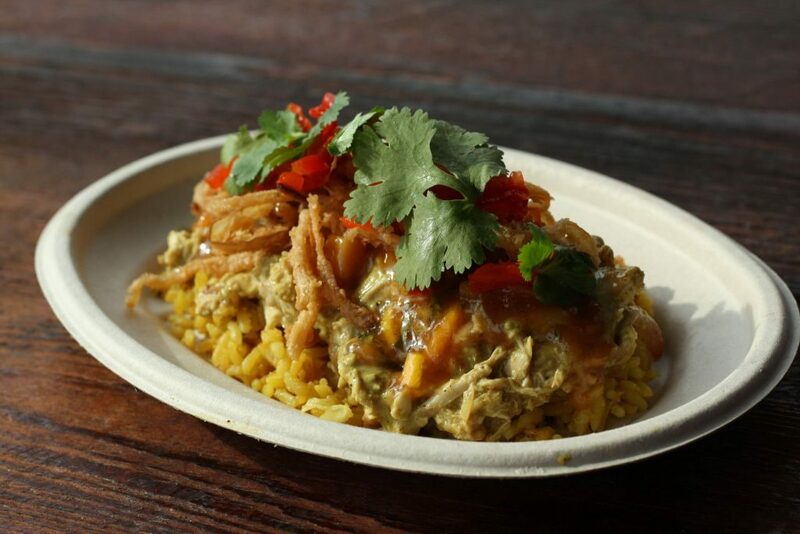 Next up was the Curry Chicken, a South African curry made with coconut milk and pulled rotisserie chicken atop shredded spaghetti squash slightly sweetened by mango chutney. Fried onions, sliced peppadews and cilantro complete the dish. It was one of the big hits of the night. Many attendees declared it the favorite, marveling at the depth, balance and intensity of flavors—but there was another dish still to come that would cause some to swing their vote. The Braised Oxtail at Peli Peli Kitchen. Photo By Luke Chang. Keeping in line with the meatier selections was the braised oxtail. Peli Peli Kitchen braises the oxtail for three hours with a mirepoix sauce made with celery, onions, carrots and rosemary. 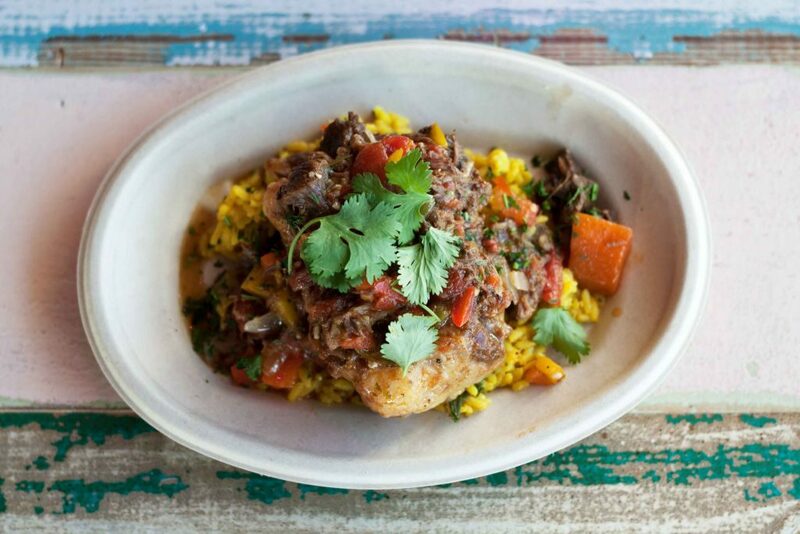 The oxtail is served on the restaurant’s signature turmeric-seasoned yellow rice and topped with chakalaka sauce, a tomato-based sauce that includes tri-colored bell peppers, chopped tomatoes and cilantro. 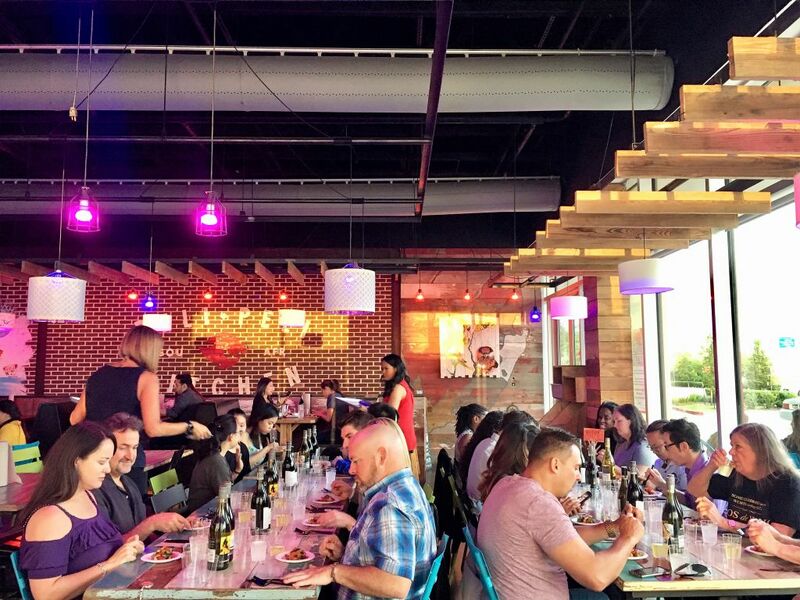 At that point, diners were split on which entrée was better: the oxtail or the chicken curry. To accompany this hearty oxtail dish, Cimafranca chose the 2015 Durbanville Hills ‘Bastion’ Red Blend, an 80-percent Pinotage and 20-percent Syrah blend. Her rationale is as follows:“This elegant blend has concentrated sweet berry fruits, sweet wood spice, soft tannins and a lengthy, rich finish. This wine accentuates the flavorful meatiness and marbling of the dish”. The 2015 Durbanville Hills ‘Bastion’ Red Blend is $8 per glass and $30 per bottle. To wrap up the meal, Peli Peli Kitchen served its popular Sticky Toffee Cupcake with cream cheese sticky toffee icing and honeycomb. To sip along with the final course, Cimafranca chose the 2015 Fairview ‘La Beryl’ Blanc, named after Fairview proprietor Charles Beck’s late mother. She says the wine is “71-percent Chenin Blanc and 29-percent Muscat; fragrant and sumptuous with a balanced finesse peach, honey, and litchi.” The 2015 Fairview ‘La Beryl’ Blanc is $8 per glass or $30 per bottle. (Note it is currently only sold at Peli Peli’s Galleria location and was brought to Peli Peli Kitchen as a wine dinner exclusive). As the saying goes, “a good time was had by all” and certainly no one went home hungry (or thirsty). Watch for more interesting Houston Food Finder reader events in the coming months.